The quotation above is simple and sweet. For any of us who have mentioned to others that we volunteer as listeners and received the puzzled response, “What? You just listen?” the poster is a welcomed acknowledgment of listening’s value. Still, the quotation can pull something more into awareness. What could listening mean that is ‘more than you can imagine?’ So often we move quickly, not just with our bodies but with also with our hearts and minds. To stay for more than a nano second with a thought, in a culture fascinated with multi-tasking as a sign of personal value, is counter-cultural. If the quotation is meant to be poetic, if that’s what ‘more than you can imagine’ is pointing to, that would be satisfying enough. But what if it’s more than pretty poetry? Or, what if pretty poetry’s point is to bring us beyond what we think we know? What is more than you can imagine? I’m really asking. You have experienced moments in listening when the whole session hits you in a way that you couldn’t have known in advance. It’s either more enriching than you could have expected or more full of heartache than you could imagine anyone bearing – yet they bear up and tell you all about it. Many times we have shared about the paradox of being present with someone who is suffering and yet, even when there is no end of suffering in sight, listener and guest feel mysteriously better after being with each other. Listening means more than any of us can imagine. We will never be able to pin it down, do it perfectly, have a prescription for listening that never fails. At the LP we have an intimate understanding of the truth that this simple poster points to. 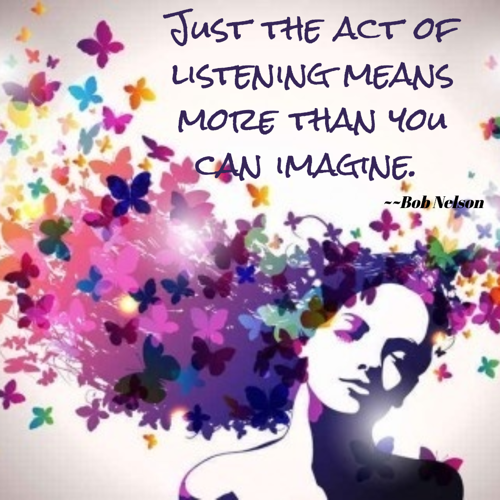 Just the act of listening means more than anyone could ever imagine. Even if you are the kind of person that has a wild and vivid imagination, there is still the reality that no one’s mind knows the limit of reality. That is a weirdly circular statement that probably won’t make it to poster status. What I mean is even if we imagine something vast, reality is not limited by imagination. Listening means more than you can imagine.